Your solar panels in Salt Lake City work hard all year round, providing your home or business with the energy it needs to function smoothly. Of course, since your solar panels are working so hard, you’ll want to treat them with care and kindness. Fortunately, caring for your solar panels is fairly straightforward. As Salt Lake’s leading provider of alternative energy sources and materials, Gardner Energy knows a few things about taking care of your array. Salt Lake gets some wild weather throughout the year. Thankfully, your solar panel array is up to the challenge but it does need some occasional attention. How you care for your array changes based on the season. Because Salt Lake stays dry, you’ll have to rinse off your array during the summer using your garden hose. 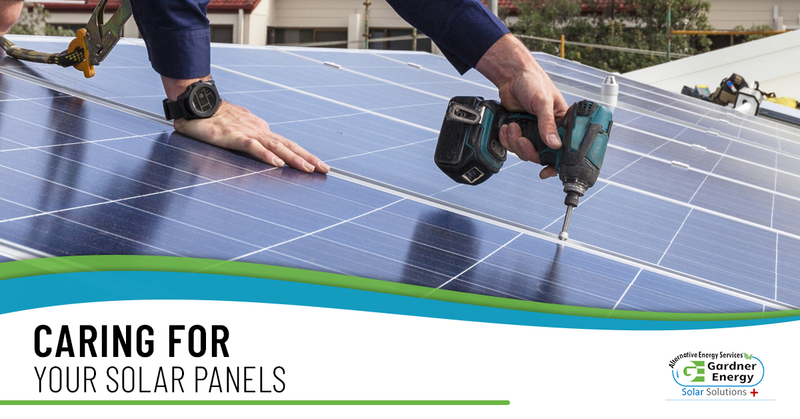 Your panels can accumulate debris like leaves, pollen, sap, and animal droppings. Washing away all of these unwanted materials makes sure that your solar panels can absorb plenty of sunlight with no interruptions. As the leaves start to change, so does your solar panel care habits. When you’re up on the roof taking care of your gutters, that’s the perfect time to clear away any debris from your solar panel installation. Simply brush away the leaves, branches, and other vegetation that’s built up. Winters in Salt Lake City can be harsh, so you’ll need to pay extra attention to your array. Snow and ice can pile up on your panels and cause issues like rust, corrosion, and even damage to your roof. If you’re comfortable, you can climb onto the roof and sweep away the snow, but don’t use any salts to try and melt the ice. Either wait for the sun to melt it naturally, or connect with our service team and we’ll take care of it for you. When the flowers start to bloom, that’s your sign that it’s time to start spring cleaning. Head up to the roof to carry out a careful examination of your solar panel array. Look for damage to your roof or the array’s rack. Check each panel for scratches, marks, or even burn spots on the glass. Finally, take a look for any missing pieces and parts. If your solar panels aren’t looking as bright and shiny as they should, you can clean them up pretty easily. Just soak a rag or sponge and gently wipe it down. For stubborn spots or patches of debris, use a mild soap. Don’t use anything like steel wool, or an abrasive chemical cleaner. This can damage your panels, leading to other complications down the road. Tired of seeing your energy bill go up every month? Looking to embrace an alternative energy source? Choose Gardner Energy! We’ve helped homes and businesses all over Utah go solar, reducing the carbon footprint, and do their part to mitigate the effects of climate change. Contact us today to set up a free quote!